Even if they get a delay it will be a few months extra. They have to decide what to do with those months really fast. I really hope they end up agreeing on another referendum, but it does seem like wishful thinking in the current situation. Everyone wants a deal, but everyone wants a different deal. The terms of what everyone wants seem to be mutually exclusive, and I don't see how this ends except with no-deal Brexit or just no Brexit. It just depends on whether or not institutional paralysis tends toward putting on the brakes or driving off the cliff. Yeah, they absolutely can. EU will probably grant an extension for something like "we voted to hold a referendum but can't do that for a few weeks", but they've stated that they are only going to give extensions for things like that that are going to materially effect the situation that need time to shake out. They've said time and time again that they are not going to allow an extension to the UK for them to hope that some magical deal fairy will solve everything in 51 months instead of 48 months. If nothing has changed, nothing is going to change, but parliament just needs the EU to hold the door open for another couple months so that they can decide exactly how many feet they want outside, that door is getting closed at 48 months, and the cat better get used to living with all 4 feet outside. British MPs have approved the amendment that rejects a no-deal Brexit at any time in any circumstances. They now will vote on another amendment to tonight's motion which calls for a delay of Brexit until May 22, for further preparations to take place. It also acknowledges a definitive departure from the EU in 2021. Am I understanding this correctly.... They just voted that under no circumstances will they leave the EU without an agreement and will vote later today to delay Brexit until May 22nd which is just over 2 months away. This means they need to have a deal in place and agreed to in two months. AND they will definitely be leaving the EU in another 2 years and they really, really, REALLY, mean it this time. I don't see the EU granting them another two months to faff around. Well, seems like things are even more interesting (chaotic) than usual in UK parliament today. From what I understood, even the people proposing that vote, didn't except this outcome. And now they are voting, again, on whether they really, truly mean what they just voted in favor of? Will be fun if the result is now different. And by fun I mean completely insane. If this happens, I think EU should stop all negotiation for good. I can easily see EU giving them another 2 months, just for that small, naive hope that UK live up to what they just voted for. I just dont see it making any difference when the 2 months run out. Ok so Parliament has just ruled out a no-deal under any circumstances by 312-308. That’s a majority of 4. No deal is now dead. There will either have to be a substantial extension to article 50, or it’ll have to be rescinded. I think Brexit might just have died. Edit: and I fully expect Theresa May to step down tonight. The 312-308 vote for not leaving without a deal, which for inexplicable reasons had to be voted on again 15 minutes later, just resulted in an even higher vote count in favor of not leaving without a deal (to 320+ in favor from what I gathered), despite UK government trying to push its own members not to vote in favor of their own proposal (due to the amendment). Just what the country needs, and what no-one what thought was possible - even less leadership. Tell me more about this not having someone in charge. Considering the result of the vote it seems like having no prime minister will result in more leadership than having May hanging around. 9 more people voted for 'No leaving without a deal' the second time, after May asked them not to do just that. Not even Trump has managed that I believe. Not that I think she will resign unless forced. Seems to me that stubbornness is the only thing she ever had to offer. I repeat, is there even a plan at this point? Because this is genuinely starting to seem like the lead into WWI. Everyone knows it's stupid, but everyone's too stubborn to do the necessary things to prevent the stupidest outcome. Corbyn wants them to adopt his plan (which is basically the same as what we have now, without any future say in how the EU develops) although what he really wants is a GE, hard brexiters are probably wondering what to do to force a No Deal, and everyone is probably thinking ‘the only way out of this mess is to rescind article 50’. But a plan. No, not really. Does this vote actually have enforceable results, or is it just wishful thinking. 30 seconds before the deadline is this resolution going to activate and cancel Article 50? Crucially, does the EU think that this vote will do that? I'm so confused as to what's going to happen now. They voted not to actually do a brexit without a deal, but they have no deal, and are not likely to have one by the deadline in two weeks? What then? Do they just not do the brexit? So their continued inaction means no deal brexit regardless, if nothing else is agreed upon? 2. However, Parliament has effectively ruled that out. Theresa May must now either find a deal that Parliament will back and the EU will accept, before the 29th, or seek an extension. I fully expect the EU to only accept a 2 year extension in this scenario, so I would imagine this is the most likely outcome. 3. If she doesn’t pursue it, she’d be in contempt of parliament. She’s done that before (the only PM found guilty of that in living memory) but this would be serious - probably serious enough to collapse the Government. Corbyn would call a vote of no confidence again in that scenario. It would probably pass. If that happens I don’t think an extension to article 50 would be enough. It would have to be rescinded while a GE takes place and then we’d have to go through all this again. Possibly. 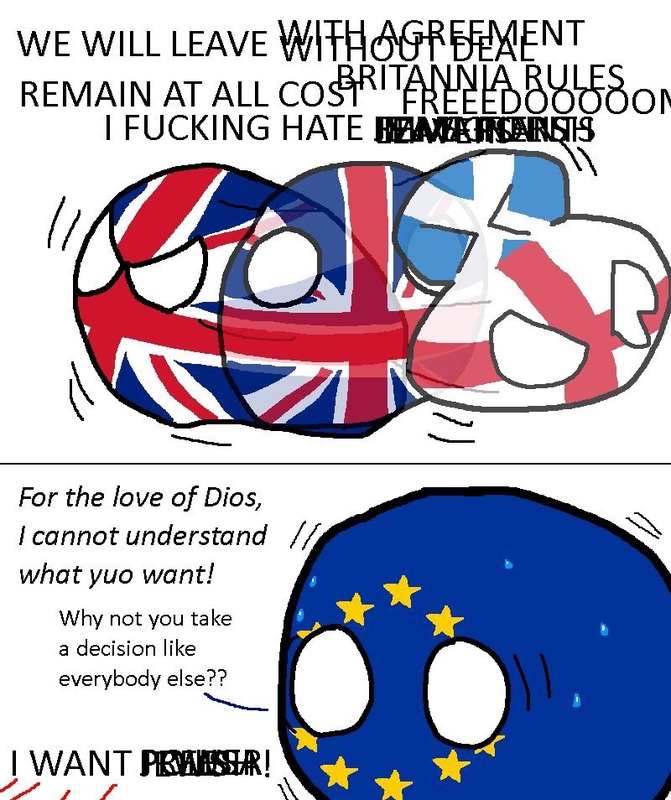 I don’t think the EU would accept a simple extension in that scenario. Sounds like it is just a "this is how the government should act". Nobody can truly force the government to actually do anything - no matter if the topic is Brexit or anything else. Then if the government doesn't do as parliament want, they can do a vote of no confidence, but for one, good luck with that, and second, it would be too late anyway. Actually, is the government able to cancel article 50 on its own, or would it require a vote in parliament? Considering the responses from EU politicians after the vote, it sounds like they think that UK should just leave right here and now, rather than continue the current mess for a another day. I still think they will allow an extension until the day before the next EU parliament election (May 23), when they get over todays anger. But we are getting awfully close to the loss from a no-deal being less than a continued farce. Any extension further than the next EU election (May 23) would be a complete mess, that could really hurt the EU (pretty much a constitutional crisis - how can you have a member state who are not voting - makes the whole election illegal). So the default is no deal brexit unless they agree to something else, like an extension. But the EU then has to agree to the extension, and even if they do, it'll likely only be for about two months. Christ on a cracker what a mess. You could delete this entire thread and leave just this part of this post, and it'd be just as informative as everything everyone has said. Far as I can tell, the initial vote had tricksy wording added to the end of it which some people objected to.. (i forget the wording but May added it as a "get out of the vote free" clause from what I could tell). The first vote was to remove that sentence from the end of the vote. That was the one that passed by 4. “leaving without a deal remains the default in UK and EU law unless this house and the EU ratify an agreement"
Is the phrase that was removed (which would have made any "no no deal" vote pretty pointless) for the first vote - the one that won by 4 votes. Thing is, that phrase is actually true. And is still true. Who can rescind Article 50? Is that only the Prime Minister at this point? And does that require EU approval or is it something that can just... happen? But supposedly that still means more people voted for the end result (that May did not want) than who voted for amendment. Quite a few people must have been like "yeah, I voted against this amendment", but now I'll vote for the proposal that we just changed into what the amendment said it should be". Seems really awkward, unless your only purpose was to give a middlefinger to May. It doesn't require EU approval, but I'm not clear on who can actually revoke it. I think it would require a parliamentary vote. However it can be rescinded unilaterally by the UK government. The EU court ruled on that a couple of months back. It does not require any agreement from the EU. It should also be noted that it would mean UK never leaves, and so the remaining agreements in place - including the rebate - wouldn't change. Independent Group MP Dr Sarah Wollaston's amendment, which called for an extension of Article 50 for another referendum to take place, has been rejected by 334 votes to 85 - a majority of 249.